It's Kiko Match, the ultimate test of memory! Flip cards to discover pairs of everyone's favourite* Neopet, the Kiko! Uncover images of beloved Kiko characters, such as Niten Hiroru, Bellanie, and even the dastardly Captain Dread! Do you have what it takes to... KIKO MATCH?! *May not reflect popular opinion. 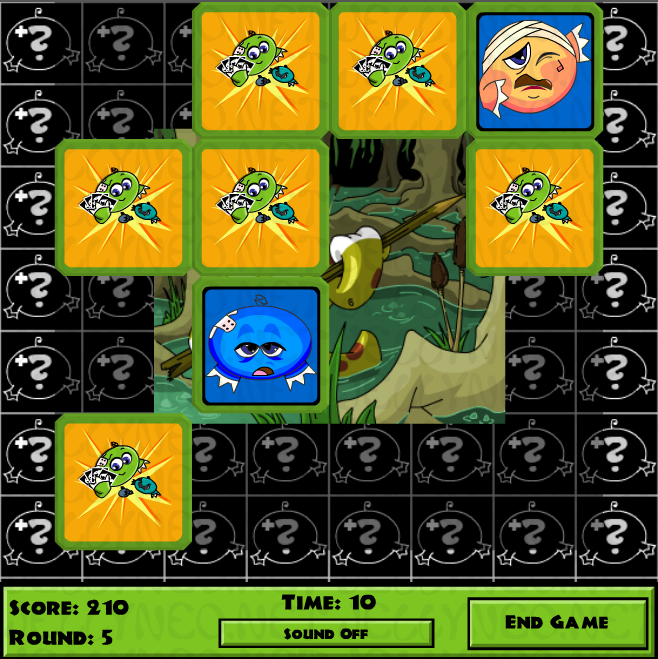 The board in Kiko Match consists of several face-down cards, laid out in a grid. To play, click on a card with your mouse to flip it over, then click on a second card. If both cards feature the same Kiko design and background color, it's a match, and the cards will be removed from the board. If the cards don't match, they will be flipped back over. To win, you must remember where cards are and make matches to clear the board. You can type the code ineedmoretime once per game to add fifteen seconds to the clock, which is recommended when low on time in later rounds, as when you run out of time the game will end. Is that Kargrax? I think it is! Oh boy! The game consists of fourteen rounds, with new cards (and thus more matches to be made) added each round. In the first six rounds, new Kiko designs with blue backgrounds will be added; after this, the Kiko designs on new cards will repeat, with differently-colored backgrounds. You are only able to make a match between two cards with the same Kiko design and background color. You will be awarded 10 points upon completing a round, and 5 bonus points for every second left on the clock. Because of this, you should try to finish a round as quickly as possible; see the Strategy section below for more information. Due to a glitch, Round 14 is inaccessible, and the game will automatically end at Round 13. Additionally, scores above 2000 points will sometimes fail to submit. Because of this, it is recommended that after Round 12 you calculate how many points you require to reach 1995, and time when you finish Round 13 to achieve that score. For example, if you have 1900 points, you need 95; since you will receive 10 points for completing the round, you should try to gain 85 points from the time bonus. Since you are awarded 5 points for every second remaining on the clock, in this example you would want to end Round 13 with 17 seconds, then end the game and submit your score. The easiest way to keep track of where you've seen which cards is to remember them in the sequence that you've seen them. It's helpful to always start from the same corner, and to turn cards over in the same order. This makes it easier to keep track of where the cards are, as the third card in your remembered sequence will be the third card from the corner you start at. 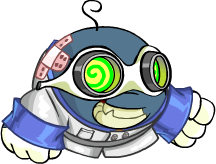 Of the ten Kiko designs that appear in the game, three of them are blue, and two are red. Between this and the fact that differently-colored backgrounds are added in later rounds, you should try to avoid thinking of the Kikos as being certain colors, and instead focus on their other traits when trying to remember where you've seen them. This allows you to remember shorter sequences; instead of "dark blue yellow background, plain red blue background, medium blue blue background" you could remember "angry yellow, crazy blue, tired blue". Another noteworthy technique is to seek out specific cards (such as all of the happy pink Kikos, or all of the cards with green backgrounds), ignoring all else. While you can find cards very quickly using this strategy, it will only work if you know which cards are present in each round. If you would like to give this a try, refer to the table in the How to Play section above between rounds and make a mental note of which cards you want to find, and in which order. Or you could use x-ray goggles. Mwahaha. Try to remember the Kikos by their facial expressions, rather than their colors. Start in one corner, and work your way in the same direction every round to better remember the locatiions of cards. On the main menu, turn animations off. Over the course of a round, the time spent waiting for the animations of cards flipping over can cost you valuable seconds. Type the code ineedmoretime once per game to add fifteen seconds to the clock. Every year on October 31, a new type of Kiko is added to the game: Halloween. This Kiko replaces the plaid one, but will appear as the first card of each new background color rather than the second-to-last. Due to how the game is structured, the Halloween Kiko will appear in all the same rounds that the plaid one does, in addition to the first round.